Book | One Up Max | To know him is to love him. Max loves sitting by the back door watching everything that goes on. But, this morning, a blinding light zooms across the yard. Then, he sees it, a strange looking critter. Zoomed to another world, Max encounters 10-foot vultures, groppers (super-long snakes with tiny arms and legs that crush their victims and razor-sharp teeth that tear into flesh), killing trees, quicksand, and other things that make him cringe. His only hope of getting home in one piece is with the help of the creature that got him there. 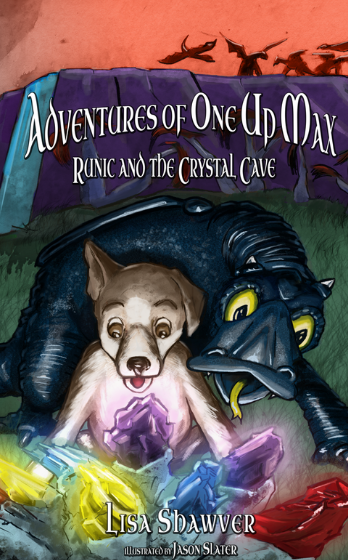 This book about the adventure of Max..Is great… This little canine keeps you wanting to see what is next!! This is not just a kids book but adult’s will enjoy it too. I am looking forward to what adventure Max will get into next!!! This is the cutest book. For children and adults too. I couldn't put it down. I loved the descriptions because it made me feel like I was there. Kids of all ages are going to fall in love with Shawver's adorable hero. Max is clever, funny and fearless. His adventures kept me turning the pages, anxious to see what would happen next. I give this book 5 Stars because it kept me wanting to know more about what Max would do next. This may be a kids book, but as an adult, I really enjoyed reading this book. I wonder what Max will get into next. I hope there will be more to come. And both my girl's age 11 & 15 loved reading about Max. Well done. Into the next adventure. Great book very interesting can’t put it down perfect for kids who love adventure. On the edge of my seat. Can’t wait for the next one. Always awesome Max my man. Such a cute book! Read it with my 8 yr old son and he loved it so much that we decided to buy a copy of it for his second grade classroom library. This book was well written great imagination on the author’s part.